Hello friends. Today, I bring you a glimpse from my summer literary rambles. I had a few extra days after working at a conference in Oxford in July, and I decided to take a train right up to the Lake District. 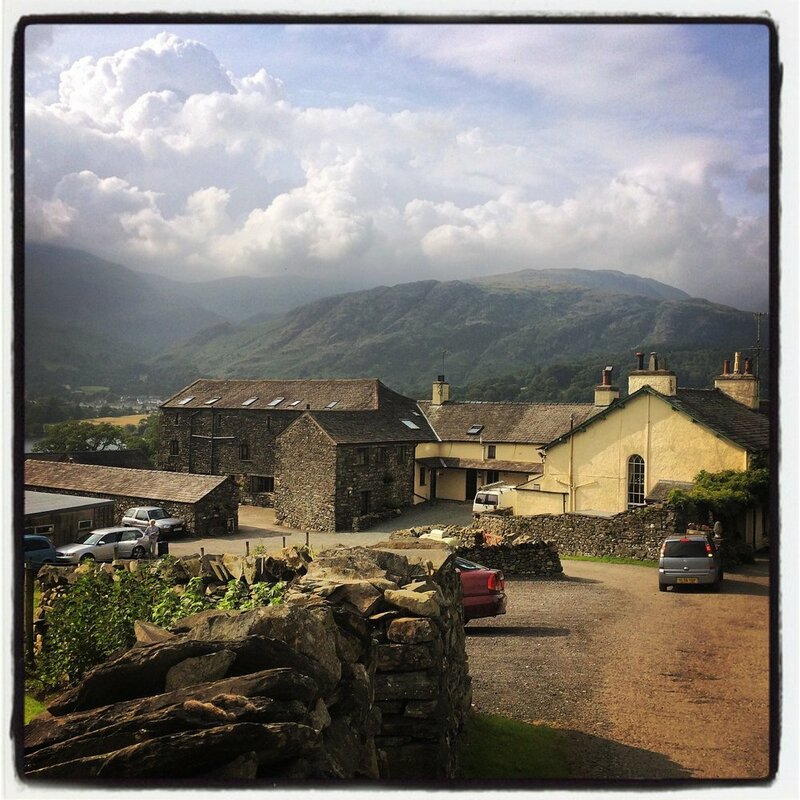 In hunting for a place to stay in Coniston, a village much deeper into the Lakes than I had yet rambled, I stumbled upon Bank Ground Farm, the house and setting that inspired Arthur Ransom's delightful Holly Howe in the Swallows and Amazons series. If you haven't yet discovered those summery, sun-kissed books with their rich realm of childhood imagination, then I suggest make your way to the nearest library. Post haste. The series, set in the Lake District in the 1920s, follows a gang of imaginative children and their outdoor and sailing adventures on a fictionalized Lake Windermere. I love the stories because they remind me of my own childhood, particularly of the years I spent on my grandmother's acreage in Texas, a sprawling, cedary bit of land which offered itself as canvas to countless imagined worlds. We siblings sailed "ships" through the fields, made castles of the trees, and oceans of the stock tanks. And the same flavor of exploration and adventure colors these stories, along with the sharp, delighted sense of independence that comes when children get to cook and make-do in the great outdoors. I felt pretty much a child again myself during those Lake District days. I pretty much walked the day long, stopping only for tea and sustenance (of which there was plenty to be had in various farmhouses and cafes!). I rambled up fields and through the halls of ancient pines and explored every footpath in my reach. I thought of Ransome walking these ways as well, thought of the children he created whose days were marked by such vast expanses of sunlight, water, and imagination. As I walked, I thought of the gift of outdoor exploration. The way that sun and wind and open sky somehow carve out places in the soul so that I arrived at my room in the evening with a wider inner self. I thought of the gift of free time - of hours unfettered by hurry or appointments, marked only by the bright sun and the growing of my hunger. I thought of the gift of not a thing to do, the lack I guess I should say, of busyness. There is always a screen, a distraction, a thing, a job to catch my eye, but during my two free days, I put it all back and made sure there was only the open earth and my two good feet to find whatever adventure I desired. And all the way through my time, I thought of the children to whom I would love to give a gift of time like this one. For times like this, hush like this, sunlight and free play like this, are the gifts that make souls and set up brains and freshen imaginations. Sometimes a taste of it comes in a good book, when an author takes all he has known as Ransome did, and weaves it into a world of words for a child to inhabit. Then, a book is a gift almost of a new inner kingdom, for it leaves the soul widened. In glimpsing the pictures below, I hope you're inspired to savor Ransome's books and taste a little of the sunlit world he wove and pictures in his writing. I hope it widens your own soul and freshens your own imagination. And spurs you to sit on the porch with a small reader and explore the grand world of Swallows and Amazons.